Born out of the Curry School of Education at the University of Virginia in 2014, we were and continue to be the only functionally grounded, musically-driven run studio in the country. All of our programming to the music…and so much more. Indoor workouts, outdoor training, & social SWEAT meet-ups. A community where all are welcome. That's tread HAPPY®. Inclusive & individual, we’re for everyone. Those who consider themselves runners and those who do not. It’s true: we tread TOGETHER and that’s not just lip service. Our studio classes break the mold, shunning an increasing obsession with competition so that our runners find the confidence to push past what they thought was previously possible. tread HAPPY® is more than just a workout. It’s here to help you Remix Your Run® - allowing you to take a classic form of fitness - running - and put a new, different, and awesome spin on it. Every interval, exercise, & drill: timed to the music. So you find the rhythm of your stride and end up pushing harder & faster but also leave feeling good. Hella Good. It’s called HAPPY after all. No matter the place or your pace. We’re in it together to help you become your fittest, healthiest self - physically, mentally, & emotionally. Our staff is certified and deeply experienced of course, but what really sets us apart: our coaching philosophy grounded in our background as teachers. We train runners of all levels and abilities, both in groups and individually, with the care and support they need to get to the starting line healthy & cross the finish line HAPPY. All you have to do is come and take those first steps. We’re here, with our beats bumpin’, to coach you so those steps become miles. 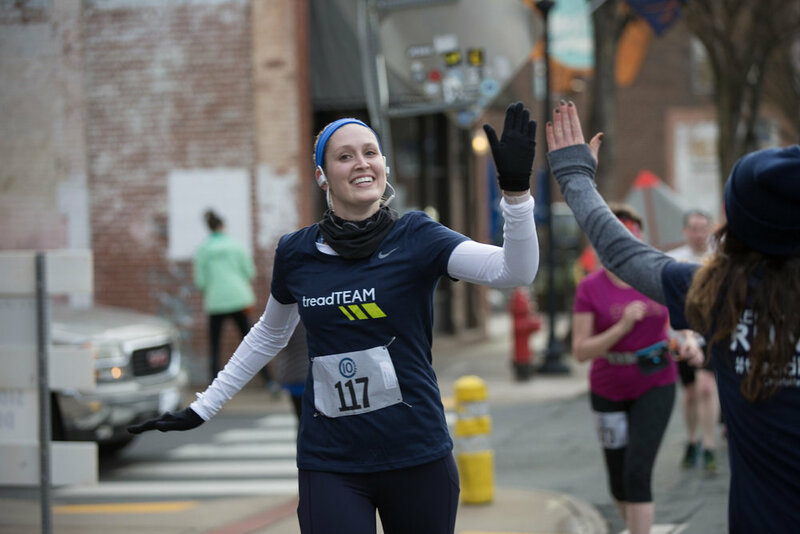 Running truly brought us together in Charlottesville. We met through mutual friends in 2010, but it wasn’t until we started to run together weekly that our friendship really grew. We began to wonder why there wasn’t a group fitness option that incorporated something we so dearly loved but that also capitalized on the social aspect of running and drew the energy of the group? The answer was simple…back then there really wasn’t. Nothing that broke the mold, that shunned an increasing obsession with data and competition. Because we wholeheartedly believed - and still believe - that running, at its core, is about you and the road. Getting in tune with your body but also losing yourself in the run. We’re so proud that to this day tread HAPPY remains the only running studio of its kind anywhere. It exists to help runners listen to their bodies. To find the rhythm of their stride so they end up pushing harder and faster…but also leave feeling really good. Come tread HAPPY with us!